This Scripture verse from John is a favorite of Sister Patricia Schap. Her life has been full of new beginnings as she followed Jesus to her calling. Sister Patricia was born in Valley City, N.D. She has two siblings. Her father’s government job with the Department of Agriculture required the family to move frequently throughout North Dakota. Sister Patricia learned early to be open to new beginnings and marvels that she attended four different high schools. 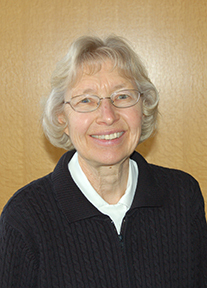 With a degree in education from Presentation College in Aberdeen, S.D., Sister Patricia’s first teaching job was at Cathedral school in Bismarck, N.D. It was here that she met the Benedictine sisters. Most notably, she found a mentor in the teacher across the hall, Sister Michael Kaliher, a member of Annunciation Monastery. “She taught me a lot and we had so much fun together,” she recalls. Sister Patricia always thought she’d marry and have children. She had been in a serious relationship with a young man but often wondered if God was calling her to a different vocation than marriage. One day Sister Patricia came across the diocesan paper, “The Dakota Catholic Action.” It was an issue devoted to vocations. One story inspired her to keep reading it over and over. “It was about a woman who was searching for her place in life. It resonated with me so I asked Sister Michael what I should do next,” says Sister Patricia. She inquired at Annunciation Monastery and was soon on her way to become a sister.